A study for the testata of Canto II from Torquato Tasso's Gerusalemme Liberata published in 1745 in two consecutive editions by Giovanni Battista Albrizzi. 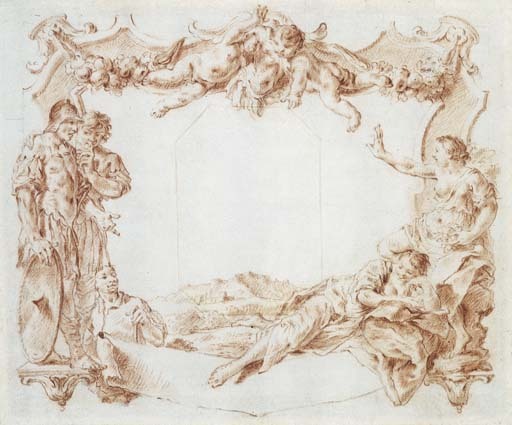 The presence of black lead underdrawing on this present sheet testifies that it is the actual sheet from which Piazzetta worked out the engraving. It is the closest to the final composition as engraved. An earlier attempt at the composition, with a large pine tree in the centre, is in the Biblioteca Reale in Turin, D. Maxwell White and E.L. Sewter, I Disegni di G.B. Piazzetta nella Biblioteca Reale di Torino, Turin, 1969, no. 53a, illustrated, an offset of which is in the Hermitage, M. Dobrolonsky, Catalogue of the Italian Drawings of the 17th and 18th Centuries, State Hermitage Museum, Leningrad, 1961, no. 1319, in its turn counterproofed, thus reverting to the original direction, on a page of the Kress album in the Pierpont Morgan Library. All three versions display the same composition with the pine tree and do not directly relate to the final engraving. Piazzetta worked on the project from 1735 and produced several series of drawn illustrations presented in a form of albums, some like the Hermitage or Kress albums, counterproofs of original. It is recorded that as early as 1743 series of illustrations to Tasso's work were sold by Albrizzi. It has been suggested that the Hermitage album acquired in 1768 was the album sold by Count Francesco Algarotti to the Dresden court for 300 ducats. The present drawing as well we the existence of these album series of illustrations demonstrate the high degree of attention Piazzetta lavished on to the project. Engraver's proofs retouched by Piazzetta have survived at the Albertina. Piazzetta frequently reworked his compositions while the printing process was under way.